In his book, “Eat Dirt”, Dr. Axe outlines a recommended diet for each gut type. It’s ideal to follow it as closely as you can in terms of what veggies to avoid and what to eat freely. 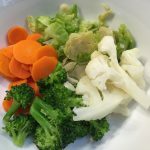 Yes, some gut types should avoid even some veggies! But just like figuring out what supplements to take can be overwhelming, so can deciding what to eat. So, here’s a breakdown of my go-to foods while I’m healing my leaky gut. Why: Since chicken collagen is best to heal the gut, I make chicken bone broth and drink that every day. You can buy bone broth, but it’s pricey. It takes time to make, but to me it’s worth it, and far less expensive than buying it pre-made. Bone broth is a critical food in the healing leaky gut diet. I buy Goat Kefir, but I make my own Coconut Kefir. Check out the link to the recipe to the left. Why: I love, love, love kefir. 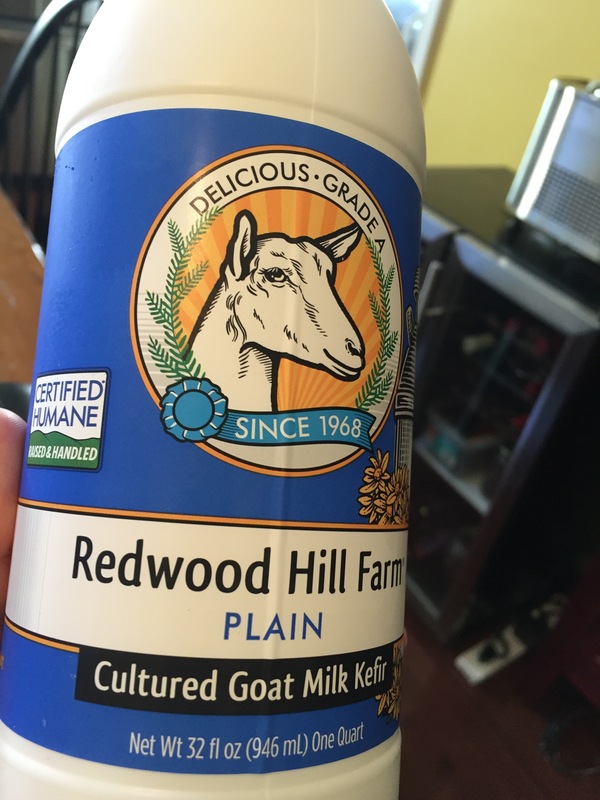 I buy goat kefir at Whole Foods or a local market, but I make my own coconut kefir. Coconut is my fave by far. Coconut has anti-microbial and anti-inflammatory effects so it supports the gut and is easier to digest than other fats. Its delicious tang becomes addictive and it keeps my digestion so regular and on track. 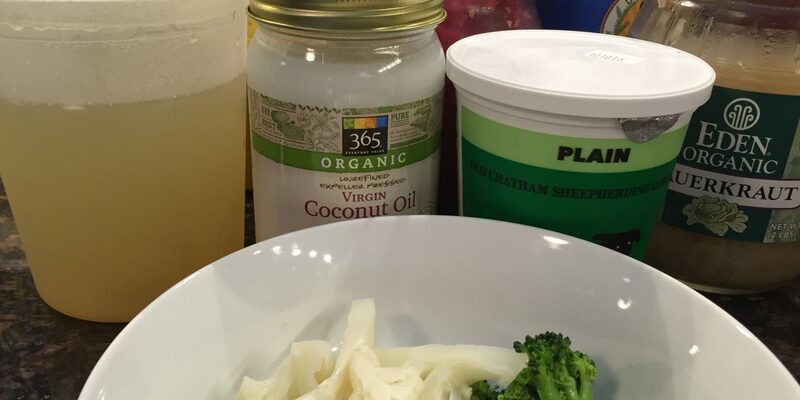 Here’s the recipe I use for my coconut kefir from Cultured Food for Life. 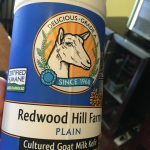 It’s the best recipe I’ve found, making the thickest, richest, non-dairy kefir I’ve made. 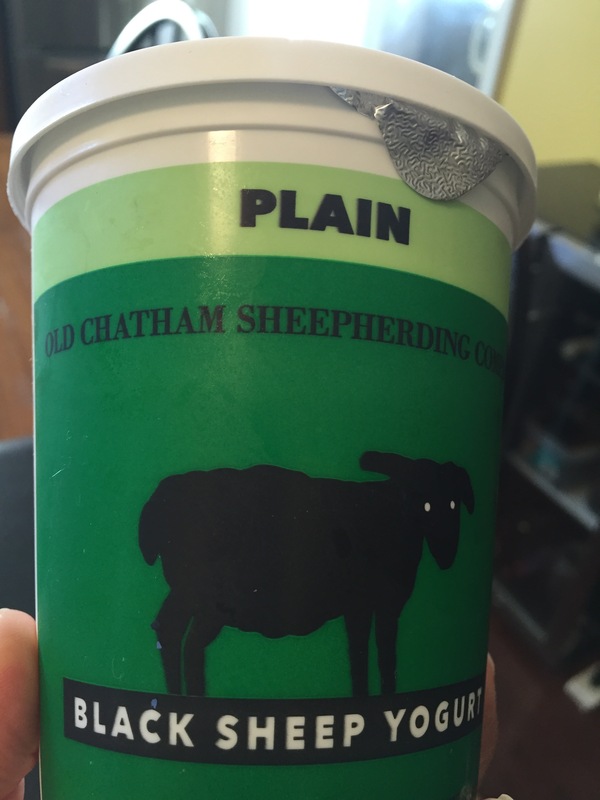 No cow’s milk for me, this sheep milk yogurt feels like the biggest treat in the world once in a while. Why: It’s recommended to avoid cow’s milk in all forms because the protein breakdown is 80% casein and 20% whey. Casein, like gluten, helps to break down the small intestine lining by turning on the Zonulin or gateway to the bloodstream, contributing to leaky gut. Other animals, like goat, 80% whey and 20% casein in their protein, so it’s believed to be better for the digestive tract. 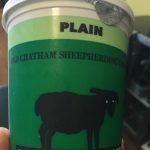 You can find Type II cow’s milk whose protein is 80% whey and 20% casein, but I stick with goat mostly and a side of sheep, especially since I have a cow’s milk allergy. 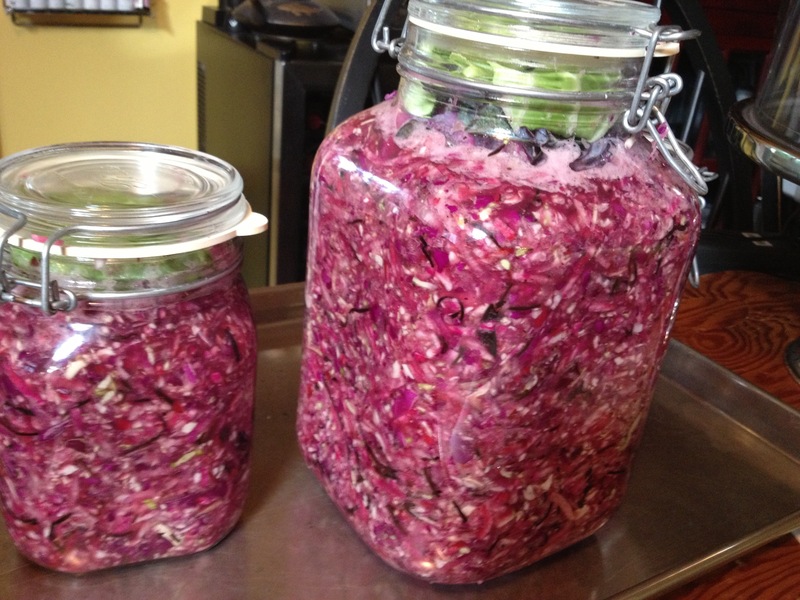 Shredded cabbage, carrots, coarse sea salt, and a sealed jar is all it takes! Why: Aid digestion and support the flora balance in the digestive tract with their naturally occurring probiotics through the fermentation process. 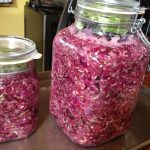 Check out Cultured Food for Life for great fermented veggie recipes and starters. Why: Coconut has anti-microbial and anti-inflammatory effects so it supports the gut and is easier to digest than other fats. Note: Coconut products are very popular, and typically support health for most people, but some people may need to moderate their intake of them. Coconut is rich in lauric acid, which is converted in the body into a compound called monolaurin, an antiviral and antibacterial that destroys a wide variety of diseases. This is why coconut products are revered to be anti-microbial, helping to guard the body against infections. I think it’s important to do what’s best for your body and to come to understand what foods support your health. I always have a variety on hand. Make life easier and delicious! Why: A great source of fiber, but easier to digest because of the cooking process. Steaming however retains the most nutrients than other cooking processes. Eating simply with little seasoning is less stress on your digestive tract while you are healing. 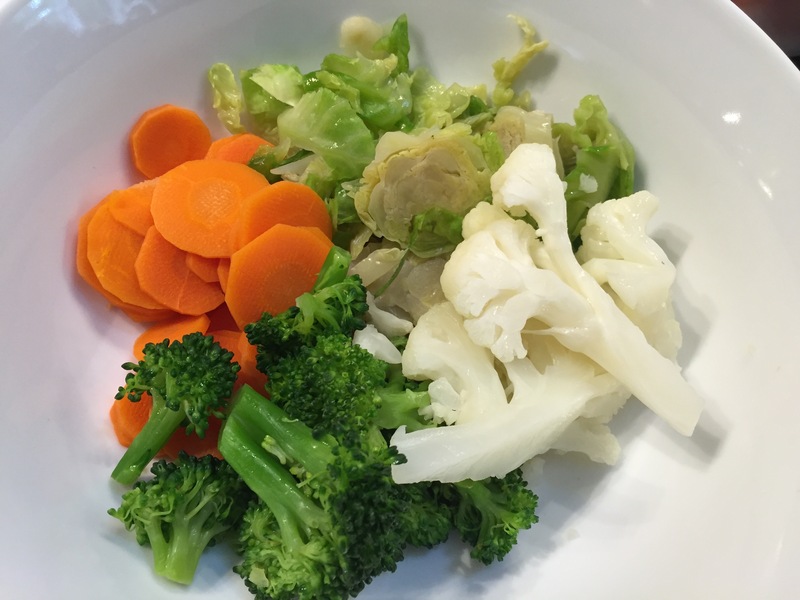 What: Veggies that are on the recommended diet for your gut type, simply steam and have ready to eat in the fridge. Why: Support the body with protein. Lean meats are easier to digest than fatty ones. Why: Most of the gut types will have to cut out most, if not all, grains. I find that Japanese sweet potatoes help me to feel full without eating grains. 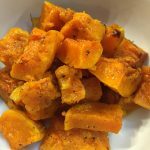 They are less sweet than yams or garnet sweet potatoes so I flavor-wise, I find they compliment a larger variety of foods. How: Rub with coconut oil, sea salt, and pepper, wrap and bake; roast with olive oil, sea salt and pepper; boil or steam and mash with seasoning. Olive oil, salt and pepper is all you need. Roast until browned, then eat or turn into a yummy soup. A staple to nourish your stomach on all levels. Why: Again, being limited with grains, the squashes help to fill me up. Plus, squashes aid digestion and soothe the stomach. 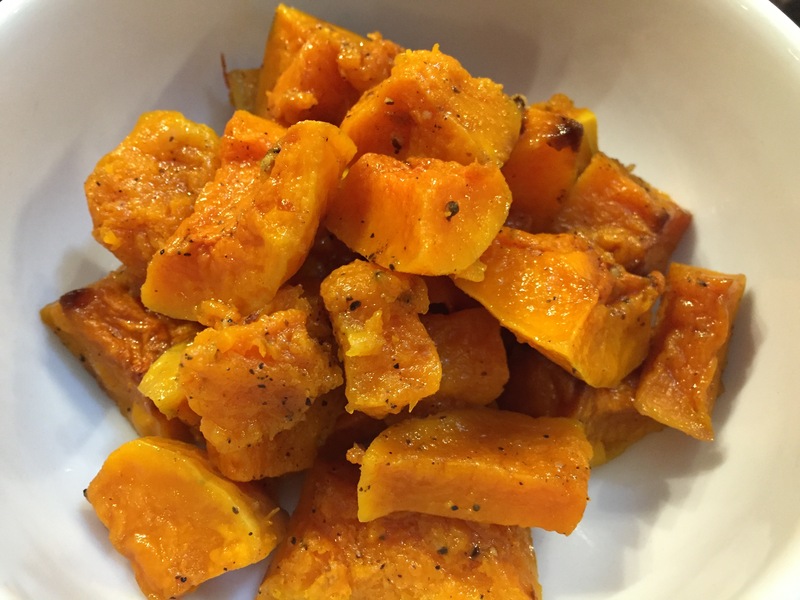 I find that roasting butternut and spaghetti squashes helps bring out rich flavors. How: Butternut squash makes delicious soup and spaghetti squash turns into an awesome noodle substitute. Why: Blueberries are one of the foods highest antioxidants protecting against disease and aging. Plus, they are high in fiber, aiding in weight loss and management. They help cleanse the body and energize brain. What: Fresh organic when in season, organic frozen when not in season. Why: Ok, it’s not a food, but I drink it all day long. Lemon aids the digestion process and helps detoxify the body and skin. It can also help the body produce collagen, which keeps that youthful appearance we all strive to keep. The added vitamin C supports a number of cellular functions in the blood, including boosting white blood cell count. Plus, lemon contains pectin, a fiber that can help you feel full, so it can aid in maintaining or losing weight. That’s alot of wins for lemon water!